Sun bleaching on the backrest of two back seats. (pictures coming) One chip in fiberglass 1/4" in size. No snap in carpet included, sorry it came up missing. The boat has a cockpit cover and a bow cover. Stock #163486 243 Explorer with very low hours! Brand new fuel module! Bow & cockpit cover! 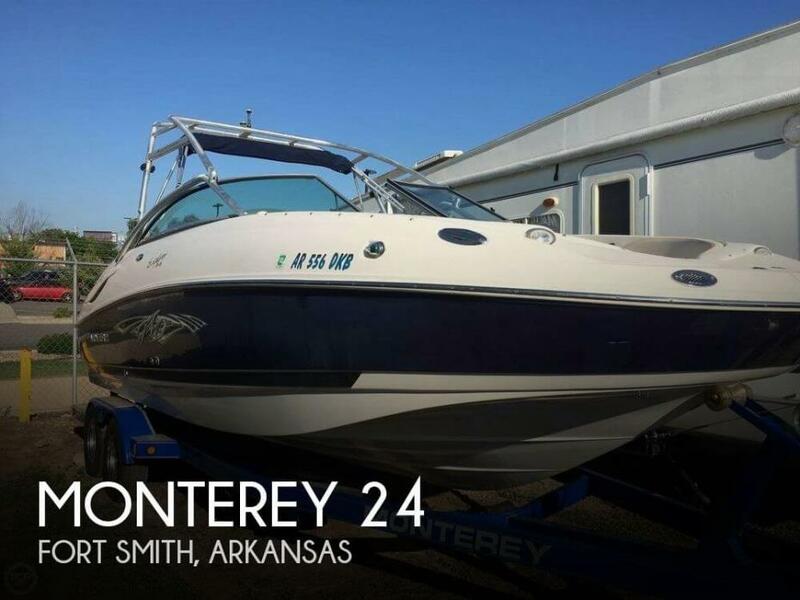 If you are in the market for a deck boat, look no further than this 2007 Monterey 243 EXPLORER, just reduced to $28,850 (offers encouraged). 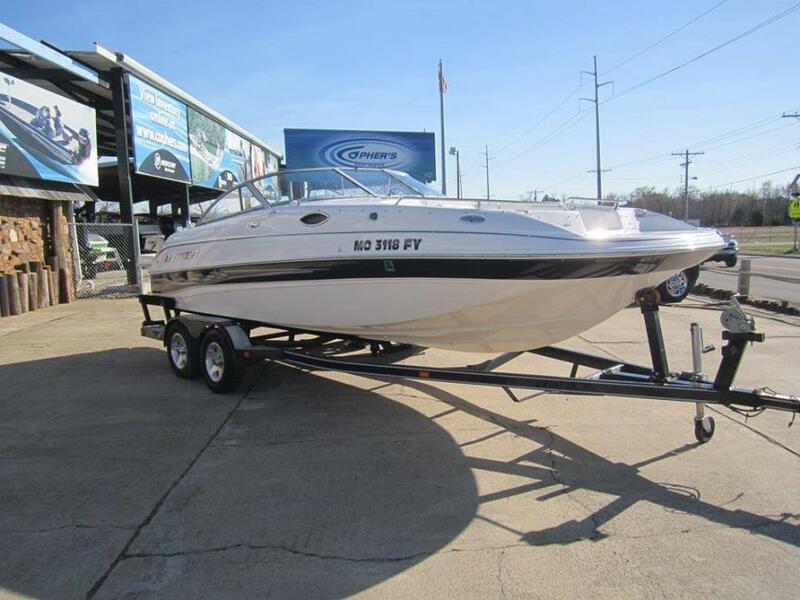 This boat is located in Fort Smith, Arkansas and is in decent condition. She is also equipped with a Mercruiser engine that has only 87 hours. Reason for selling is no longing needed. 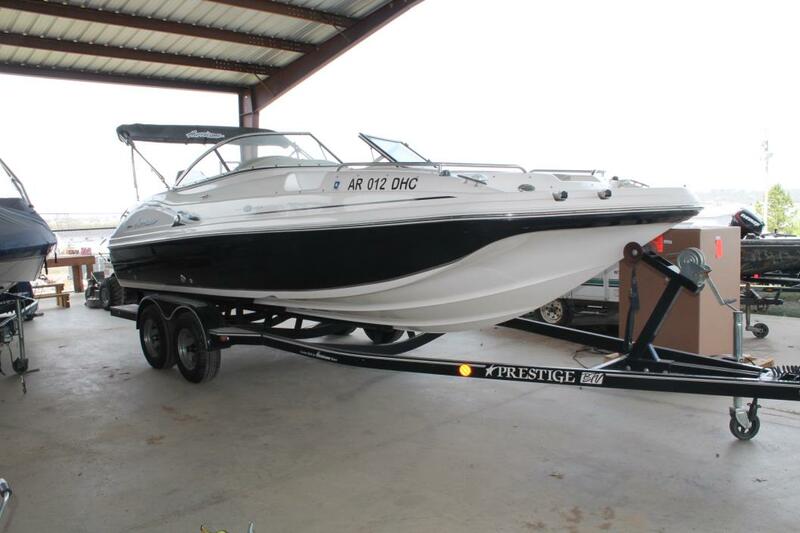 This 235SS is in very good condition, it has been stored under roof with cover snapped on when not in use and it shows Gelcoat and interior look good, inside the engine compartment and bilge are clean, Per the Seller: this boat has been taken care of Stock #170444 Like NEW! Super low hours. Fun boat - super roomy! 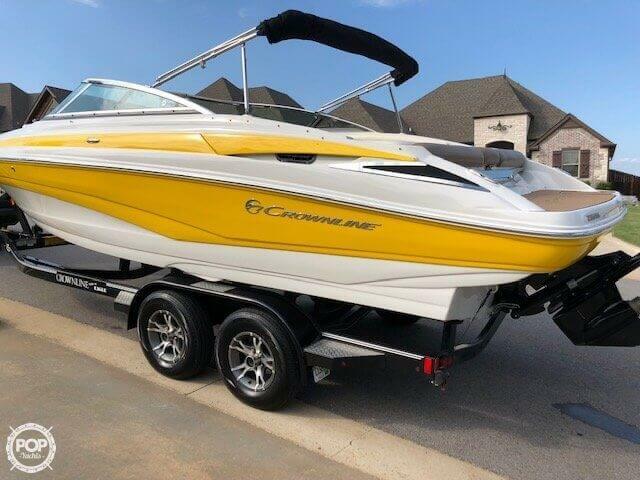 If you are in the market for a deck boat, look no further than this 2013 Crownline 235SS, priced right at $57,500 (offers encouraged). 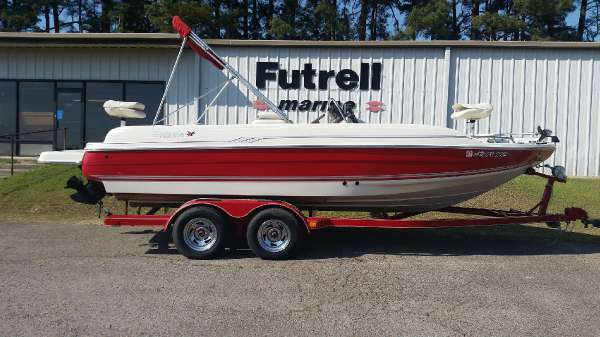 This boat is located in Mount Ida, Arkansas and is in great condition. She is also equipped with a Mercruiser engine that has only 190 hours. Reason for selling is upgrading. 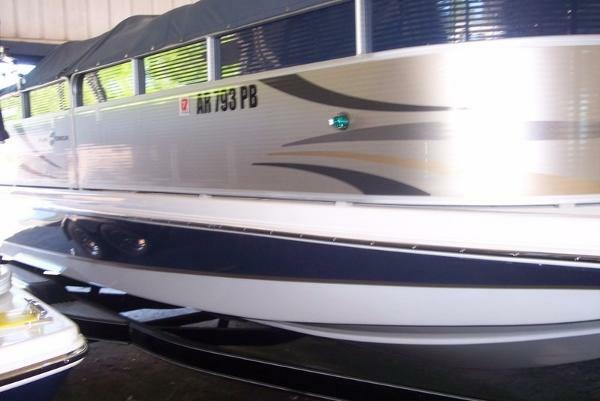 2006 Hurricane Sundeck 217, Nice 2006 Hurricane Sundeck 217 includes Honda 150HP outboard and tandem axle trailer. 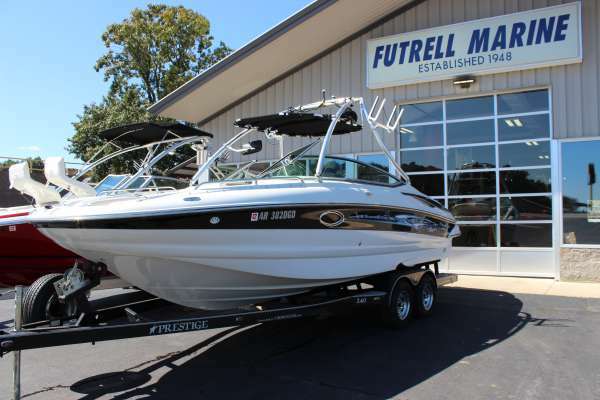 2013 Sea Ray 220 Sundeck Mint condition 2013 Sea Ray Sundeck with 5.0 Mercuiser and less than 100 hours! Wakeboard tower with speakers, upgraded stereo with sub, two amps and LED lights around speakers. Lake ready today, boat needs absolutely nothing. Will deliver within a 500 mile radius of Benton Arkansas. 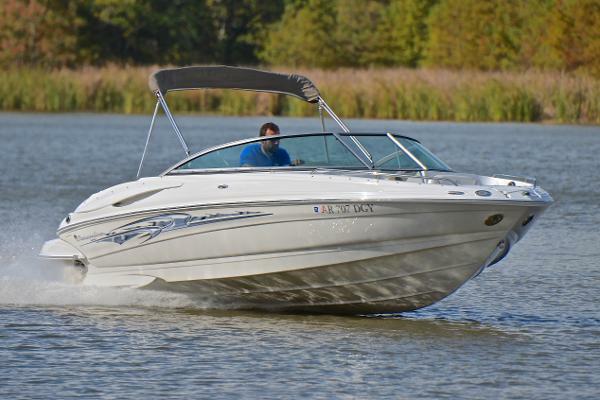 2017 Bayliner 190 Deck Boat Includes Custom Trailer w/Swing Tongue & Brakes, Optional Full Windshield, Optional Ski Tow Pylon, Cooler w/dedicated storage, Helm Bucket Seat, In-floor Ski/Wakeboard Storage, Stereo w/MP3 Input, Aerated Rear Livewell, Battery Switch, Bilge Pump, 12V Acc. 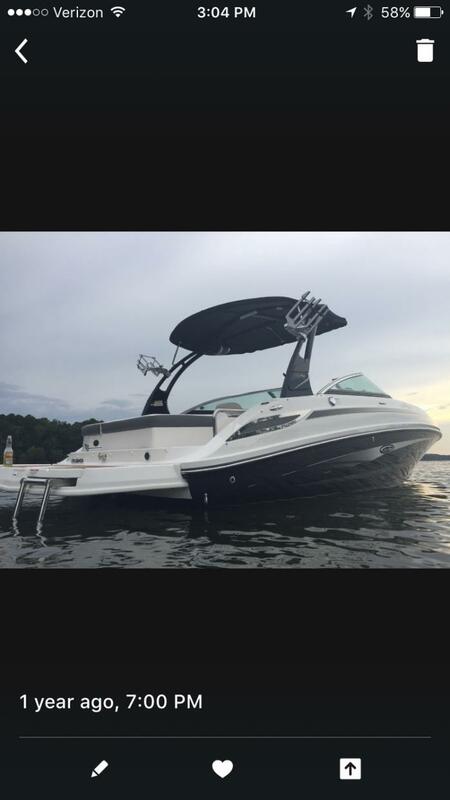 Outlet, Instrumentation, Tilt Steering, 12V Nav Lights, Anchor Locker, Transom Plaforms w/Ladder . . . . Far from basic, this design brings all the room, value and performance you need to enjoy the days on the water you crave. Fuel-efficient Mercury outboard power gets you up on plane fast - even with a maximum crew of 11 onboard. Comfortable, spacious seating provides a enjoyable cruising environment. Abundant dry storage keeps gear protected and specialized optional features give you maximum versatility from water sports to fishingfor all the capacity you'll ever need. 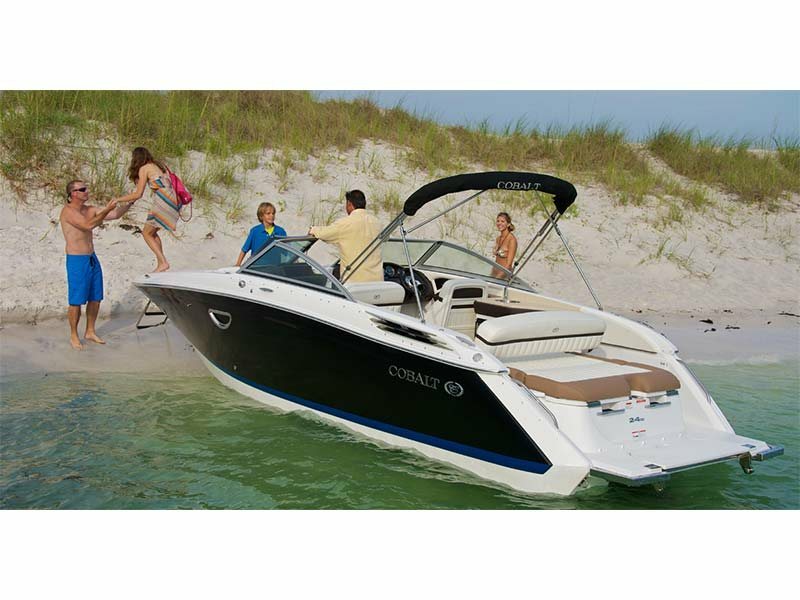 Key Features Fuel-efficient Mercury outboard power. Multiple floorplans available: choose standard windscreen or optional wraparound windshield. Innovative portside storage with tote may be replaced with an optional head with privacy curtain. "Pontoon style" seating offers a plush and comfortable cruising environment. 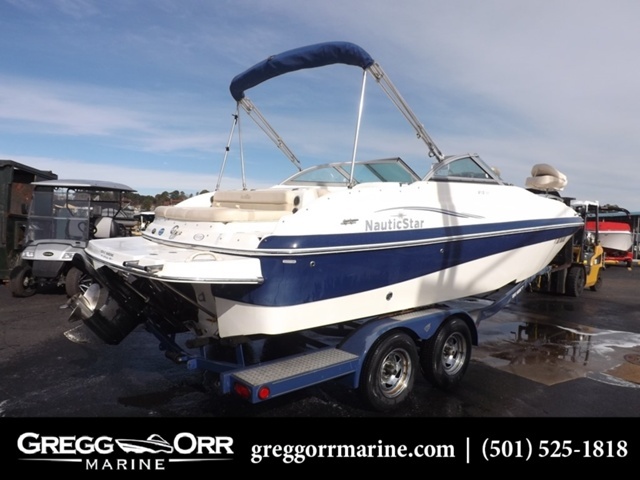 2007 NAUTIC STAR 210 DC, Very clean pre-owned deck-boat, very low hours and runs great. Interior is like new! 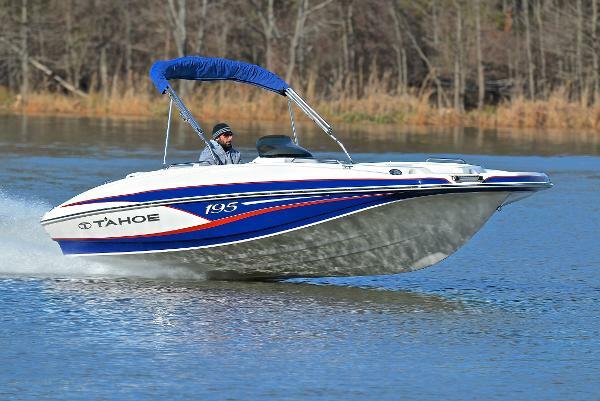 The Mercruiser 5.0 is perfect with tons of power for this 21' boat. Call us today (501)-525-1818 and schedule a demo. The boat is ready for the water! 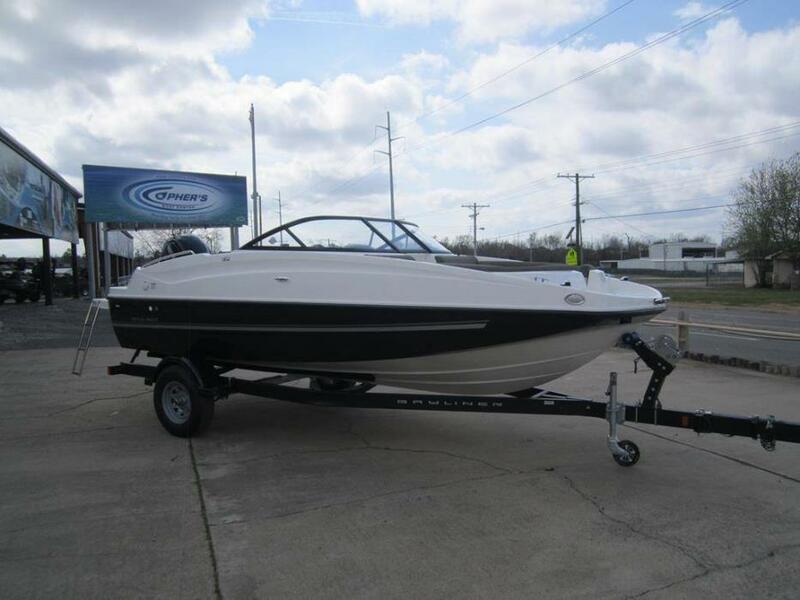 2014 Hurricane FunDeck 236 REDUCED PRICE 2014 Hurricane FD236OB BAR BOAT, GREAT FOR SUNSET CRUISING AND PARTY! When you're looking for a family boat, there's only one thing that you want: Everything. You need a boat that's ready to play hard and perform well, trip after trip, year after year, no matter what adventure you have in mind. And Hurricane's SunDeck, SunDeck Sport and FunDeck lines have you covered. Fishing, check. Wakeboarding, check. Sunset dinner cruise, check. And when you factor in the huge number of seating options, best-in-class storage and easy handling, the answer is easy. 2017 COBALT BOATS 24SD Hello there, gorgeous. Take a ride on the 24SD and you will notice all the expected Cobalt standards: quickness to plane, smooth ride, stability in turns. And does she wow. Heads will turn in amazement as she glides across the chop with all smiles aboard. You should expect that of Cobalt craftsmanship. And what will exceed those expectations is what lies inside. From the multi-use sunpad and adjustable backrest, to the plush seating arrangements and well-placed storage compartments, the 24SD features impeccable amenities that make everyone on board feel important. And be sure to invite all your extra buddies, too, because the broad shaped bow has plenty of room for extra seating. One can choose from the countless list of possibilities cockpit galley with sink, stand at the bow with filler cushion out, or fill the area for maximum sunning pleasure. Flip down those armrests, sit back and relax. Anchor at the beach and use our convenient beach boarding ladder to do some exploring. Or head to the transom and take a quick dip using the exclusive swim step. Its all here. Everything you need to keep the party going, at the pace appropriate to your needs of the moment. - Black folding arch, dual battery Switch, Bow Center Cushion, Seagrass Flooring, LED Interior lighting, Premium Sound, and more. 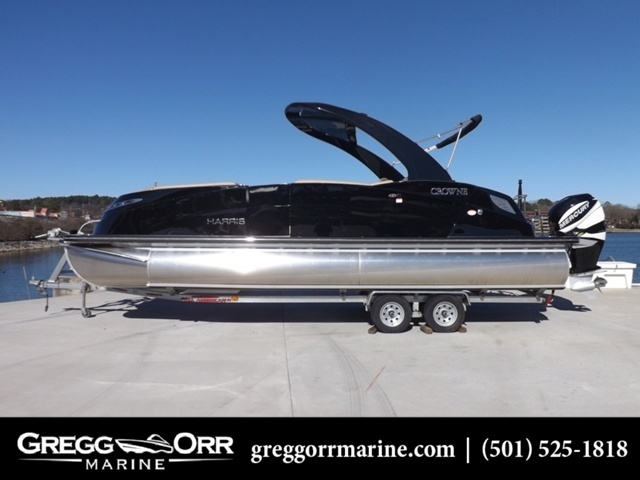 2007 Crownline 240 EX The Crownline 240 EX continues to heighten its exciting presence in the sport boat market. Its well thought out design features an impressive array of standard equipment that has become the hallmark of Crownline stern drives. The helm's dash comes with full instrumentation, including an engine hour meter. There's also a tilt steering wheel, matching Tri-Tech flip-up buckets and 12 volt receptacle. The aft lounge area comes with a convertible sun bed and extended swim platform with a four-step boarding ladder. - Hot Springs location, Arkansas Sales Tax Paid, Tower, tower speakers, wakeboard racks.